“A Clean, Well-Lighted Place” – another Hemingway classic! Hemingway leaves the reader to imagine why the man spends every night drinking alone. “Last week he tried to kill himself,” the waiter informs another. When old man leaves and the younger waiter goes home, the older waiter hesitates to close the café, reluctant “because there may be some one who needs the café.” He is alone and feels the nothingness of life, a preview of existentialist thought. Although the existentialism movement did not become popular until the middle 1900s, Hemingway has introduced this idea in his story, a tie-in to the aimless feelings of the Lost Generation. I like this story because Hemingway uses simple dialogue to show the different viewpoints of the two waiters. And what Hemingway leaves out is just as important. He leaves the reader to guess why the old man is alone, what he has lost, why he tried to kill himself, how he became deaf. Likewise, Hemingway only hints at why the older waiter is lonely, leaving the reader to imagine. “A Clean, Well-Lighted Place” is a quick read, but one that keeps you thinking. This is one of my favorite stories by Hemingway. I am a sucker for some good existential angst and the discussion of food. ‘Hills Like White Elephants’ is another good one by Hemingway. I love short stories collections. Sometimes I find it hard to get into a book(novel) but because short stories have to have a hook quite quickly I will read a short before going to sleep and look forward to another one the next night. Me too. I love the hooks and the clever endings! Thanks for commenting! I will have to read this one. It’s very short. Read it at breakfast! Love this story. In fact, I wrote about this story myself during a blogging challenge. I was writing about art for the challenge and I ran across some Van Gogh paintings that got me thinking about this story. I wrote about the connections I saw here: http://wp.me/p1hyjS-hj Also, really glad I came across your blog. Looking forward to reading more of your reviews! I think Hemingway’s short fiction is great. The seemingly simple stories are always tricky, because they mean a lot more, don’t they? Thanks for commenting and for the follow! Where can you get this one now? In the larger collections? I’m thinking I read (and loved) this short story in college. Of course, that was *ahem* years ago. I do think this is the one. Hi Sarah! 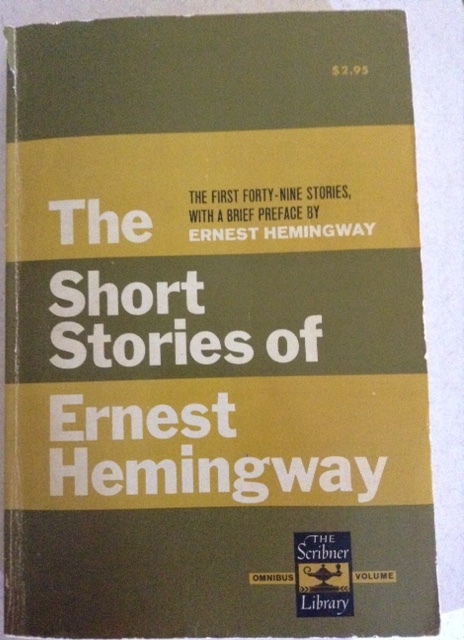 I got it from the collection “The Short Stories of Ernest Hemingway” – which I got from our used book sale at the library where I work. Hope you can find it!